If the goal is joy, this pink peony oil painting is the answer. When I smell a peony my whole being elevates and wrapped in the sweet light aroma of a the flower, no problems disease troubles are present and I am filled with joy of being. When I painted this bloom I did so as a reminder of the joy. It stirs my senses and tugs at my heart and with that energy I can move forward and out of the vibration that has created discomfort. I can absolutely confirm this painting will not only get your attention but will help you move forward so your cork, too, raises. I love peonies. My artwork shows all the different shades of pinks contrast against the dark jungle green with detailed realism. What a spectacular painting for today’s farmhouse cottage or loft style homes. When I lived in New Jersey I couldn’t wait for my peonies to bloom. Being a florist at the time I was also an advent gardener and I had a complete section which consisted of a variety of peonies. 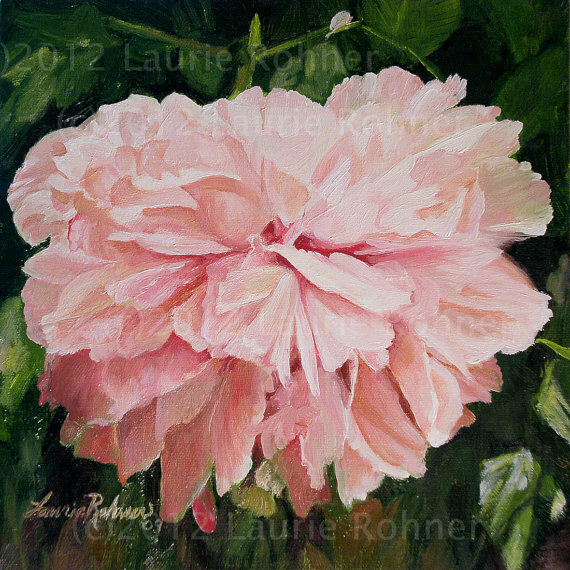 This painting I did from a photo of one of my prized peonies. The painting measures 10 x10 inches on wrapped canvas (3/4″ deep) with staples hidden under wood on the back. These paintings have beautiful color and a great finish from high quality oil paints. The staple-free sides of the canvas are painted. The painting continues around to the sides – framing is not required. Buy art, original oil painting on canvas nature art, inspired by gardens and nature, use as wall art. Original art for sale online here at Between The Weeds at Etsy. You will love my individually hand-painted art work. Great for gift giving. Ready to Hang. If everyone did exactly what they want to do? Hypothetically, people worry about everyone being selfishly oriented. “If everyone did exactly what they want to do, what kind of world would this be?” And we say, a really, really good one. Because if everyone did what they wanted to do, everyone would feel free. And if you feel free, you feel empowered. And every negative emotion that exists—hear this—every negative emotion that exists is because there is some sense of loss of freedom somewhere in there. 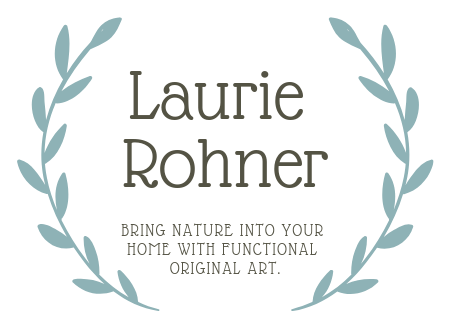 Original large watercolor, pink foxglove is a detailed garden painting and an original botanical flower nature art hand painted by Laurie Rohner. Botanical nature art at its best. Foxglove -digitalis – are an interesting flower to paint because they have many different blooms. I chose to show each one uniquely painted with detail depth as in nature. Imagine this flower surrounded by dozens of these botanical garden flower stems, it is nature giving us a smile. Today’s little inspirational thought for you to ponder. Life is your canvas; no one can paint it but you. Each moment is an invitation to create yourself and the life you’ve imagined. Too often we wait for the “big” occasion or “just the right moment” to celebrate life. Your days are just waiting to be enriched with creative thought, joyful purpose, and inspired meaning. 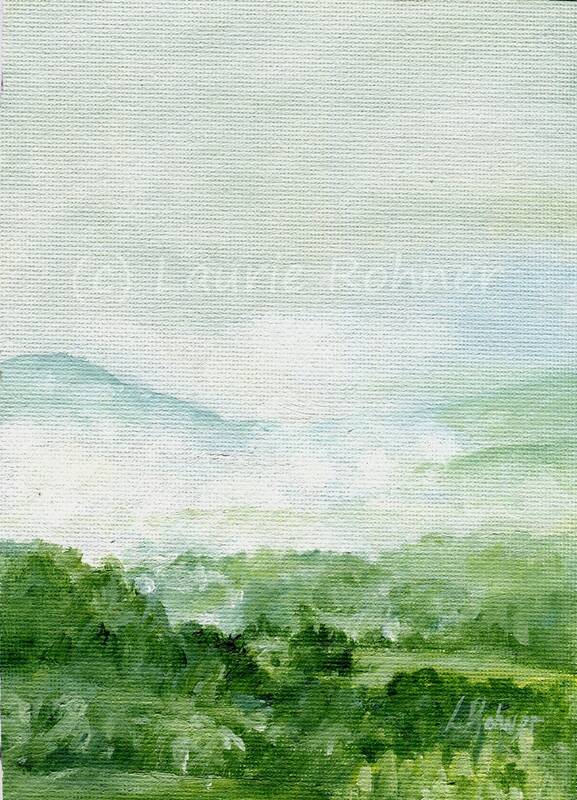 Woodland Vermont forest landscape oil painting on canvas of Fairy Trees hand painted nature art by Laurie Rohner. 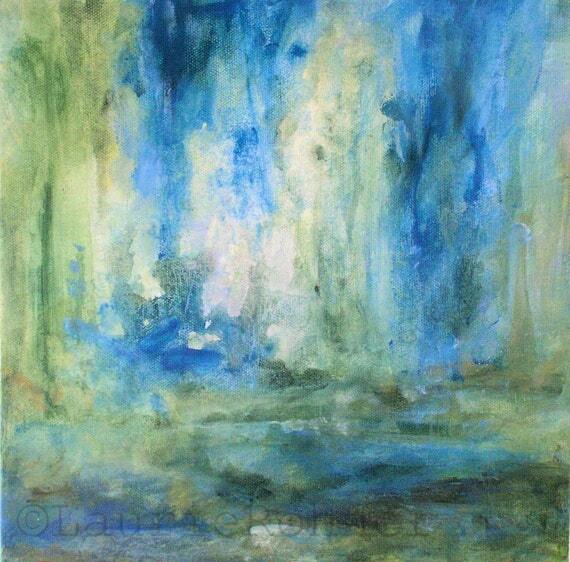 This original artwork gives you the viewer a look into the landscape of a serene enchanted forest where fairy play. The painting measures is on a gallery wrap canvas (1.25″ deep) with staples on the back. This painting is beautiful color and a great finish from high quality oil paints. Live in the fire of your dreams manifestation. “This life has an infinite number of potentials for you; we live in a made to order Universe. Whatever you believe is possible for you and take consistent action upon is what becomes your reality. 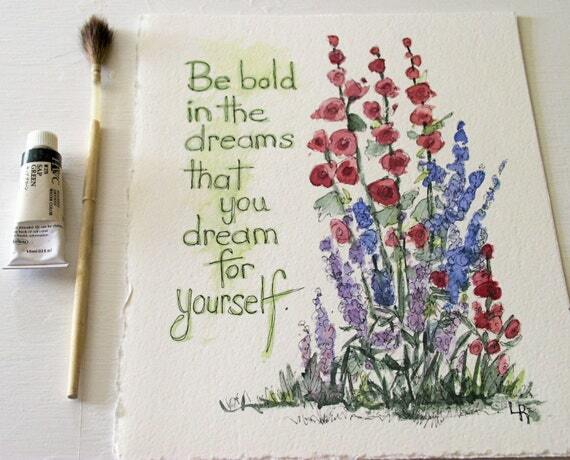 If you keep telling yourself that your dream isn’t possible, you will come to find that you are absolutely right. But my friend, if you draw a line in the sand and tell the Universe that your dreams are a reality RIGHT NOW, and take action as if that were the case, you will come to find that you are absolutely right. The question is how long can you live in the fire of your dreams manifestation? The price you have to pay to live your dream is facing your deepest darkest fear and the reward you receive from this courageous act is the realization that your fear was an illusion and that your dreams were always real. So I ask you, my friend, are you willing to go there? Are you willing to sit in fire and sacrifice the comfort of your known world for the potential of something amazing, new and unknown? Don’t you want to find out what’s on the other side of your fear? 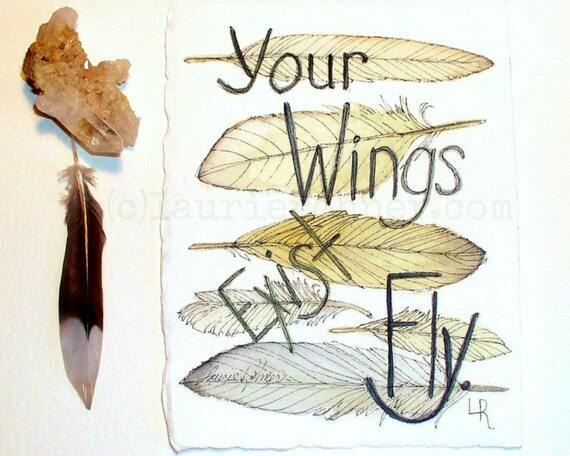 If you are not where you dream lives within you need to start living in the fire of your dreams manifestation. Dreams are so much more than just thought. Dreams come from the fire burning within filled with feeling belief and courage. I know every single living being has a dream and it is real and inside you. Fan the embers and let the flame take you to the other side of doubt and fear. Are you not worth the effort? Live your dream now this minute and watch as you are guided through the door. Do not stop just because it got hard. Keep going because it did. 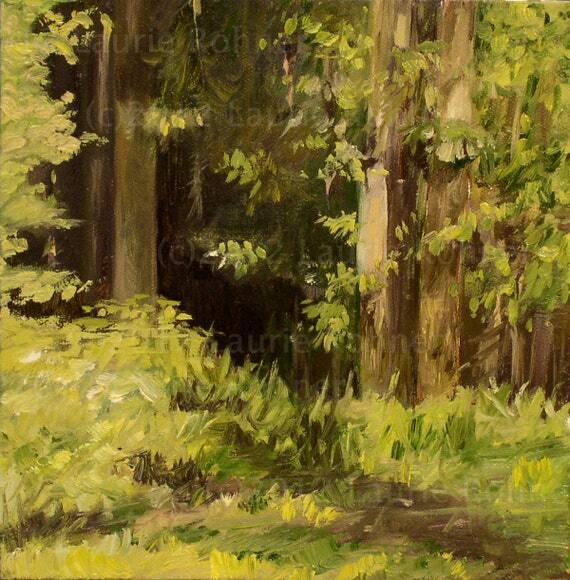 A fabulous Vermont woodland scenic landscape oil painting titled Birches is original nature art by Laurie Rohner. These birch trees stand against the blue skies painted on 6 x 6 inch panel and comes unframed. When you realize that things are not nearly as bad as they might have been, you have taken the first step toward working your way through any problem. What you cannot do is stop and never take the next step on your journey towards the abundance or success you want in your life. Staying focused on the energy of your own life is imperative to moving forward. Life will test you more and more as you start to move away from the lower energies of negative thinking but is always giving you tools to elevate your self and life. 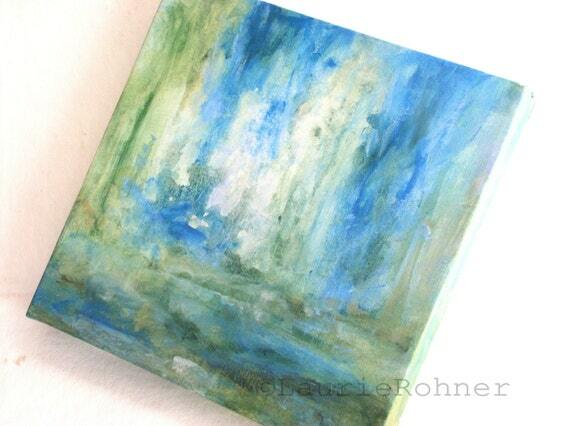 The painting measures 10 x 10 inches on wrapped canvas (3/4″ deep) with staples hidden under wood on the back. These paintings have beautiful color and a great finish from high quality oil paints. The staple-free sides of the canvas are painted. The painting continues around to the sides – framing is not required. Today I found a great post from Lisa Jacobs about running a handmade business but I think her wonderful advise pertains to anything you want to achieve in life. Great read and advise so check it out here.